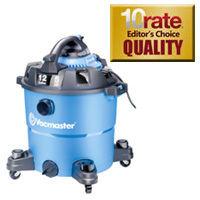 The Vacmaster VBV1210 is not only a powerful wet/dry vacuum, but it’s a incredibly mighty blower. We were pleased to find that with the touch of a button, the blower detaches from the top. It’s advertised to blow at 210 MPH, and it’s certainly strong. The suction works very well too, getting up spills and messes quickly. For being so powerful, this shop vac works fairly quietly. There’s an extra-wide drain that makes emptying the tank faster. Furthermore, the construction is durable and rugged; the casters look built to last for a long time. Overall, a solid, versatile purchase at $88.99.